I am Arcturas, the leader of the Arcturian race, of the beings of the Ascended ones. We are a technological race we are 5th dimensional technology, beyond, way beyond the concept of the conscious mind of most humans. Our creator, mother/father, to work with the light technology and we can help you to recreate more light into your physical structure. We can help you to integrate more light into your light bodies and we have a very simple technology. If you would like an experience in increased light quotient, you have positioned above this building some of our brothers and sisters standing by to work with each and every one of you. We cannot do this work unless you give permission. We cannot do this work unless you ask. So therefore, I must ask each and every one of you as a group collective, do we have permission to work with your light? Should I take the silence as a collective no? Should I take the silence as you do not wish to interact with us? If you do wish to interact with us please say yes. (Group replies “yes”) You see unless you speak the word “yes”, we do not have permission. So just allow yourself to sit comfortably and this will take just a few moments. I would like to say to you that you will not get 100% light quotient increase or your light quotient increased to 100% in one single moment, because if you did your cellular structure would not, in most cases, be able to cope with the light increase and you would disappear. Many of you got tasks that you have volunteered to do upon this planet, so therefore you would like to stay. You see, every time you ask us for a light quotient increase it will be increased by the relevant command you call in, by the will of your own individual glorious I AM presence. So now, I, Arcturas, will bring down this light… you just open yourselves up to receive. And we have now gathered here all the light that you are holding in this room to activate the diamond frequency. Feel it and imagine it that diamond energy all around you. You will understand and know that you do receive and trust that your consciousness can do, that you are together with me and you are in the diamond. Gaia is now receiving the diamond frequency and reaching all on your planet. This is not only for where you are in a physical location on your planet. Gaia and her light body is now receiving the diamond frequency. And all colours will now come thru this diamond. And there will be many more colours for you to see. Colours for which we do not even have words in your language. The celestial colours come swiftly. Allow these colours to dance, to dance in your cellular structure, the molecules, the electrons, super electrons and microtrons, your subatomic particles, allow full spectrum of the Shamballa Diamond to flow through the whole of your cellular structure, transforming, reconstructing, transmuting all your cellular memory of failure, all cellular memory of abuse or abusing, all cellular memory. It is your own mind withholding love. I, Germaine, will bring a big charge of this energy or a large blast of this energy, however you would like to put it. And I bring this energy now! You can energize with this Shamballa diamond. How will you do that? You can bring the energy through by saying “activate the diamond “, it will enhance your working in conjunction with all other energies be it Shamballa, or any other kind of Shamballa, as I said, energy any way in which you work in a spiritual way. If you use this light of the diamond, or love of the diamond, the energy of the diamond to bring the light into dark corners, into situations where there is disharmony, any situation or anything that is not of the love. This is mind, given to you this day. 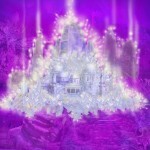 The Diamond is activated in your hearts now. Love, pure love. Where ever you go, whomever you touch. Crystal Skull Workshop, Agape Center, Plattsburg, N.Y.